School’s back in session! 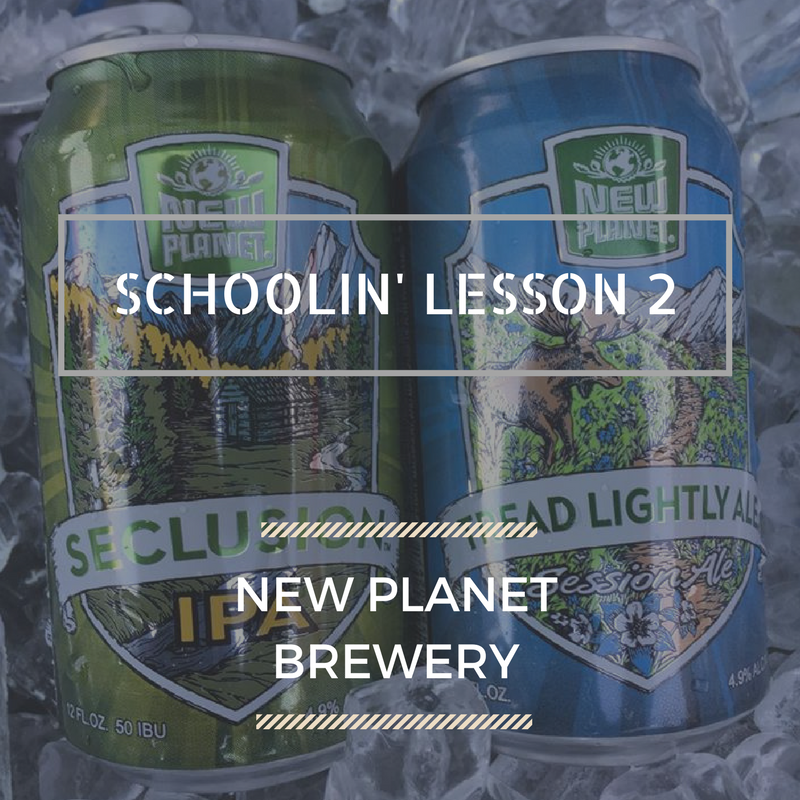 Last month, we started class with some “Lesson Plans” to educate you, our beloved beer drinkers, on matters relating to how we do things at New Planet Beer. Today, we continue the lesson plans! Are there any styles of beer that are harder to make gluten-free or gluten-reduced? Not so much. Just about every style you can think of is brewable whether it is crafted to be gluten-free or to remove gluten. In other words, there isn’t much standing in our way when it comes to making the best beer styles accessible to our hop-head, gluten-conscious consumer. If you truly want a wheat beer…you are out of luck. Speaking of hops…What’s the difference between adding hops to traditional brews and gluten-free or gluten-reduced ones? Great question, Grasshopper. Hop utilization (how well the hops have imparted their taste and aroma into the beer) is different in gluten-free grain (what we use) versus barley grain (traditional beer grain). What this means for New Planet Beer is that managing bitterness in gluten-free is a harder task than in conventional beer. Our beers that are brewed with gluten-free grain take on bitterness at a higher level than those of traditional grains, so we need to be really careful when adding hops to get it just right. Do you feel that there is a stigma around gluten-free or gluten-reduced beers? Definitely. But like many things in life, the best way to cure stigma is through education, and we’re happy to be educating the masses on just how awesome gluten-free and gluten-reduced beers (especially ours!) are. Luckily, though, we at New Planet see a positive shift in perception as gluten-free and gluten-reduced beers keep getting better and better. We still believe that the best education is to sample the beers at craft beer festivals, local liquor stores, and restaurants. We know that when folks get a chance to taste the beers themselves, a lot of those preconceived notions melt away, and they’re walking away with a new six pack in tow! What are you brewing right now? Right now, we’re brewing our new Blonde Ale that just won Gold Medal at the Denver International Competition ( April 2017) made from Colorado Millet, 100% gluten-free grain. This is a recipe that we’ve been refining and perfecting for a while now. This marks our third batch, and we’re excited for everyone to try it! Without sounding braggadocious (not something Matthew McConaughey is known to say! ), we really believe that this is a game-changer. As we mentioned before, there is still a stigma around gluten-free and gluten-reduced beers, and if education is the best cure for that, then this is our PhD thesis…thought, time, care, and passion has gone into this beer, and we see it competing with traditional craft beers like no other gluten-free or gluten-reduced beer has ever done before. Alright. Great. But how much is this game-changer gonna cost me? Ha! Fair question. Let us put it this way: when we set out to craft New Planet’s Blonde Ale, we wanted to create a beer that reminded us of the beers we were loving before our Celiac diagnosis. In other words, we wanted a beer that had character, flavor, and personality in spades. A true craft beer. With our Blonde Ale, we’ve got it dialed in. We also wanted to make it affordable, so we’ve priced it competitively in our home market for just $8.99 per six pack. Good beer does not need to cost $16.99 a four pack if you know what I mean. That concludes class for another day. Please recycle your New Planet Beer homework bottles. Track down our Blonde Ale or Seclusion IPA for your next take-home exam! It seems like a simple enough question right? I always thought of myself holding a sign that said, “Will brew for beer” or something like that. But like many things that are special about this industry, I didn’t go about this alone. When my wife, Seneca Murley, and I opened New Planet Beer in 2009, craft beer was seemingly everywhere we looked. From our homebase in Boulder, Colorado, there were dozens of craft breweries within biking distance, and even more within a 30 mile radius. As we were getting started, we had a helping hand from some great people at amazing breweries. These folks not only helped us accomplish our dream by being invaluable resources, but some, like John Legnard at Blue Moon, even lent me equipment “back in the day.” Thankfully, Mike Bristol from Bristol Brewing, Tom Hennessey at Colorado Boy, and Bob Baile at Twisted Pine were there to get us through some of the more difficult aspects of opening a brewery, too. One thing Seneca and I noticed when we looked around our fellow breweries, though, was a lack of gluten-free beers. Since I was diagnosed Celiac, I’ve been a Gluten Free Advocate. That means I work to spread awareness around Celiac disease and gluten sensitivity. So when we started brewing, it was a natural fit for us to aim to craft delicious ales that everyone could enjoy. We settled on the name New Planet Beer, because for many, when they’re diagnosed with a gluten allergy, it’s like they’re living in a new world. We also feel strongly about supporting Mother Earth…and New Planet Beer was born! Of course, brewing without “traditional” grains provides its challenges, as you can imagine! Early on, our biggest challenge was working with non-traditional grains like sorghum. We were convinced we could concoct craft beer with traditional character without the “usual grain suspects.” After some tweaking and countless “Quality Assurance” taste tests, we felt we’d made some beers that would stake our ground. Now that our Flagship beers (Tread Lightly Ale and Seclusion IPA) seem to be hitting their stride, our current challenge is growing our company responsibly and sustainably so that we can share our beer with even more people. After 8 years in business we’re also facing more competition in the gluten-free and gluten-reduced space. But as the saying goes, “A rising tide lifts all ships.” We see this competition as a good, healthy thing. It means we’re doing something right. It also pushes us to make sure we don’t get complacent. It reminds us that we’re in this for the long-haul. Right now, we’re brewing our reformulated Blonde Ale. I’m a tinkerer by nature, and until something is just right, I’m not satisfied. This is a recipe that I have played around with quite a bit over the years, but I can say now that if I didn’t tell you, you’d have no idea it was gluten-free. This new combination takes advantage of a different millet, and it really complements the Blonde’s already-notable characteristics. A light lemon-grass color with a crisp, clean taste, this Blonde Ale is it! I’m excited to share it with you, so make sure to look for it in your local liquor store. And, if you don’t see it, be sure to ask them to reach out so we can stock their shelves! That’s a long-winded answer to why we started New Planet Beer, but I hope you enjoyed reading it as much as I enjoy brewing beer for you.